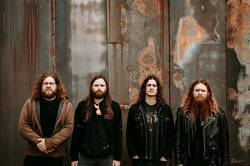 Inter Arma are back with a new record next Friday, April 12, titled Sulphur English. To prep fans for the record they've unveiled a video for the song "Howling Lands" now. The band is scheduled for Decibel’s Metal & Beer Fest Pre-Fest and also have a tour scheduled with Thantifaxath, beginning in May. Relapse Records is handling the release. Watch the video below. SPB chatted with the group in 2016.